“Music is life, and life is music,” the man says to me. I look out over my friend’s head to the Caribbean Sea that lay beyond. I am taking a moment to realize where I am. Who I am. What I am. And who I am with. For a year I have been living and volunteering in Southeast Jamaica, the area that is the furthest from tourism, the ‘forgotten parish’ they call it sometimes. This is a place where people don’t put on airs for anyone. For me, it’s a dream come true. I always had a fascination with Jamaica, a curiosity that emerged mostly from the strong sounds of the music I had heard leaking up into the US. When I later received the letter inviting me to serve and live for two years in Jamaica, I got on the plane. During my early days on the island, I met a man whom I will never forget. One evening some other volunteers and I had finished our training for the day and decided to attend a stage show. There was a solid reggae band holding it down as different singers/DJs came up and sang songs to get a positive response from the audience. Eventually a man named Jah Rubal came on the stage and began singing. He pulled up the tune, stopped it in the middle, and invited all the volunteers to come up to dance. All of a sudden we were standing on the stage with Jah Rubal as the bass and drum came in and the tune continued. People in the shadows slowly started to dance. Jah Rubal and I developed a friendship; he became a mentor to me as a musician. He showed me his notebook of lyrics that he kept with him, songs he had written sitting down by the ocean. I soon learned that I could never see Jah Rubal on a Friday or Saturday because of his devotion as a Rastafarian to the sabbath. On Sunday, he would say, “I will roam again.” I learned about his side profession as a broom maker, and about his vision and ultimate goal of being able to one day share his music abroad. As we sat down on a cliff overlooking the Caribbean sea, he also taught me about singing. I laid down the rhythm on my ukulele and he began to sing about a world without music. “It would be a dark world. It would be a dead world,” he sang. I was amazed months later when I sat down with him for an ital (vegetarian) meal of rice, vegetables, and ackee. As we ate our food under a tin roof being pelted by rain, I looked over his shoulder and noticed the lyrics to his song ‘world without music’ were written on his plywood wall. Months later, I was able to get into the studio and record the song. When Jah Rubal arrived at the Caveman Studios (Caveman was the original producer for Sizzla and many other great musicians) I felt that I was in the presence of a celebrity. “Rubal wah gwan, long time mi neva see you” one rasta man called. “Mi just cook up some dumplings, fill ya belly.” After the recording session, Caveman said “Rubal I been listening to you since I was a kid when were on the Yellowman Sound system and your voice still sounds sweet.” Later that day we rode back on the bus and Rubal seemed to know and greet everyone. The bus driver, the man pumping the gas, even the pretty girl nursing the baby next to us on the bus said “wa Gwan Rubal.” As I looked out the window as the bus departed Kingston, I thought of Rubal as a good man, a country man, and a man whose dream it is to travel abroad to share his music. This past spring I was able to host my friend Silas, a good friend of Rootfire, and we talked about sharing a little bit about Jamaican music and culture. Jah Rubal immediately came to mind. 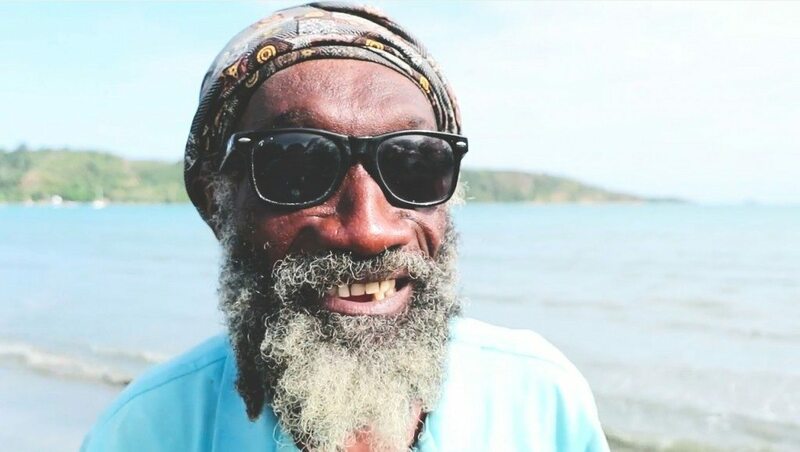 We met Jah Rubal by the seaside where he has been his entire life and had a chance to honor him by hearing his continued perspective on life and music. I want to spread the word about Jah Rubal, and hopefully enable him to bring his wisdom, energy, and unique reggae vibes to the world beyond Jamaica’s borders. Listen to more tunes by Jah Rubal here. Phillip is a University of Vermont (UVM) environmental studies graduate doing a volunteer program in Jamaica working on teaching sustainable environmental principles. I met Phillip in a soccer game at UVM, and years later reconnected as he joined an open mic night in Charlottesville’s Pink Warehouse.